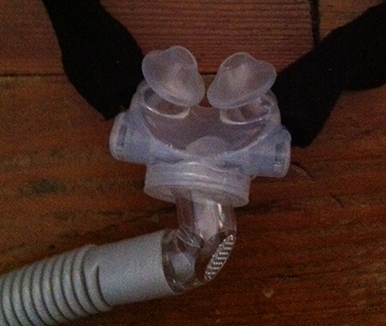 I’ve been sleeping with a CPAP device for several years and during the entire time I’ve always used a full-face mask. It’s worked alright but I still have several bad nights every now and then along with several moderate sleep nights. I know what it’s like to have great sleep so I’ve been aware for a while that perhaps it was time to try something new. The Resmed Quattro FX I’ve been using has worked alright. Out of the three or four different full-face mask types I’ve used over the years it’s my favorite as far as comfort and effectiveness but it’s not perfect and one of the worst things about this mask is that the headgear and mask cushion require frequent replacement. Sometimes I can stretch the life out a few months but on average I’m replacing the parts every month or two. This is an expensive problem. The headgear typically runs about $35 (though mysteriously ever now and then I can buy it from my DME or Amazon for $15-$40). The mask cushions cost about $40 to $60 (again, prices seem to fluctuate with my DME and on Amazon). In the end, I’m usually paying around $85-$90 each time I replace both parts. My wallet can’t take this hit any more. There was a time when I had some reimbursement options through my employer-provided healthcare program but with recent changes (and increased medical costs) the money hasn’t been available to me for the past three years. I figured it was time to try a different type of mask, especially if I’m throwing away the cost of a mask every few months. Rather than deal with another full-face mask I finally decided to make the leap to a nasal solution. I didn’t want to deal with cushion seal problems again so I opted to try a nasal “pillow”. I’m certain the use of the word “pillow” was driven by some marketing team. I wouldn’t call it a pillow. It’s a piece of silicone that gets jammed up against my nose and if the headgear is too tight, or I haven’t selected the correct size, then the last thing I’ll think of in the morning is a pillow. I recently received a new CPAP prescription so I still had the piece of paper sitting around. I don’t care to deal with my local DME very often unless I absolutely need a new piece of equipment that day. I’ve often used Amazon.com and I also have ordered from CPAP.com several times. A prescription isn’t required to order mask parts but an entirely new mask does require a prescription (that’s kind of odd when one thinks about it – every replacement part can be purchased individually without a prescript though it would cost a lot more than just buying a whole mask). CPAP.com makes submitting a prescription as painless as possible. I simply scanned the prescription, submitted it to them via an online form, and then waited less than 24 hours for it to be accepted (I submitted it on a Sunday and received confirmation that it was accept the following Monday morning). I reviewed several nasal pillow masks on CPAP.com and eventually settled on the RespCare Aloha Nasal Pillow Mask. Both the reviews and the cost were appealing. In addition, replacement pillows and headgear would only cost around $50 all together, which is much less than my current replacement parts. Switching from a full-face mask to a nasal pillow isn’t an easy transition. It’s a very different experience. The most obvious difference is that one is no longer placing a large mask over the face. The area of contact is greatly reduced and is basically not much larger than the nostrils. The other adjustment is having all of the air pushed through the nose so breathing is a little different. Proper sizing of the pillow along with correct tightness of the headgear are key to having a good experience. Fortunately, the Aloha mask comes with all three sizes of pillows to try. I started out using the medium size the first night but I think, due to the incorrect size selection and over-tightening of the headgear, I ended up with a very sore nose (though the treatment was highly effective). I thought maybe the pillow was too small so I tried the large size the next night but that did not go well and treatment was not very effective. I could feel it wasn’t as effective the next day. By this time my nose was getting sore and it didn’t help that it was already a bit sore before I started with the pillows. I gave my nose a break one night and went back to the full-face mask to heal up before using it again. The next time I tried it (a light nap on the weekend) I tested out the small pillow, which actually seemed to work very well for me and cause very little irritation. My nose isn’t particularly small but this seemed to fit my nostrils better, as far as I can tell. I also made sure to loosen up the headgear a bit and worked on positioning the hose so it didn’t pull too much. I think it’s working much better than my full-face masks did and I suspect it will be highly effective once I’m fully adjusted. With the full-face mask I could talk a bit within the mask. With a nasal pillow it’s more difficult and feels a bit odd because air is being forced out of my mouth if I open it while using the pillow. I still use some lanolin oil to combat soreness and the humidifier setting isn’t much lower than it was with the full-face mask. I’m hoping this will continue to work and actually work better than the full-face mask. I have a chin strap and I’ve tried to use it a few nights but I actually seem to sleep better without it. Having the humidity turned up will combat dryness that may occur from opening my mouth in my sleep, though I haven’t noticed a problem with this yet. The other problem with the chin strap is that it puts some pressure on the nasal pillow headgear, throwing the adjustment off and making it slightly more uncomfortable. So far I think this may work better than the full-face mask in the long run but it’s too early to know for sure. I suspect that every now and then I’ll still need to use the full-face mask (such as when I have a cold) but it may become my preferred mask type. Updated 07/06/2014: I’ve had phenomenal success using this mask. “Bad nights” are extremely rare these days. I did have some problems with it rubbing under the bridge of my nose, sometimes leaving a sore. The use of lanolin oil combined with not making the straps to tight have eliminated this problem. The reduced cost of replacement parts is also a bonus. I can typically purchase a new set of headgear and a cushion for nearly the cost of what I previously paid for only a cushion for the full-face mask. Use of chin-strap is critical and can require some additional adjustment.